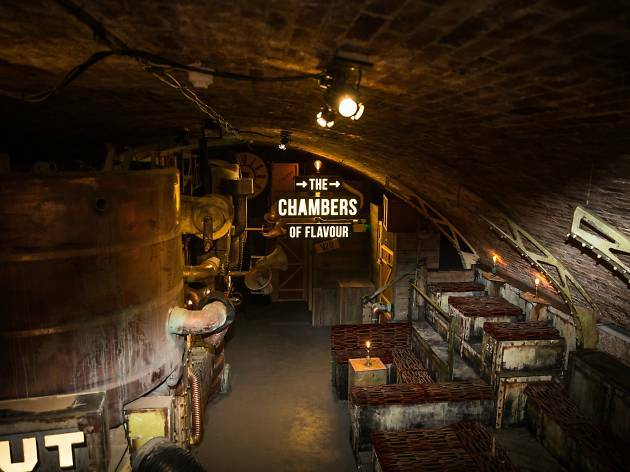 The newest immersive dining experience, in a secret East London location. 1) There are five brilliantly designed ‘chambers’ and each is completely different from the last, or so it seems… sorry, saying too much! 2) Your meal ticket doesn’t include booze (apart from a welcome drink), so head to the bar before it begins to stock up with as much as you would usually drink with dinner. 3) It’s a good idea to wear trousers. 4) It would make a great second or third date but a dreadful first. 5) And that’s because there’s quite a lot of audience participation. 6) Your dietary requirements will be well catered to as long as you give them plenty of notice. 7) Having said that, this is not an event for picky eaters. 8) You can take your booze from chamber to chamber, but not your glass – to avoid spilling, presumably – so only pour what you’ll drink in a sitting. Otherwise you’ll end up downing more drinks than you would at a rugby end of season party and things will get messy. 9) It’s easy to get split up from your friends so stick together like glue. 10) It’s loads of fun. Out of this world! Loved it and so will you! Tickets are hot, hot, hot & there's a very good reason for that - it's amazing! Expect the unexpected & have fun, we did! 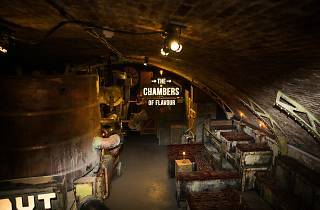 Chamber of Flavours is a great multi roomed immersive dining experience. I travelled through four very different rooms all with a lot of immersive actvity to get involved in. You are not allowed to give too much away without spoiling the suspense and surprise of each room to future travellers. So all I can really say is that the rooms are decorated very well with a lot of imagination has gone into them and the actors all play their roles with great professionalism and brings humour to all the rooms. For me the best dining rooms are most certainly the first room and the last room highly comical. For the food I personally did not like the starters which you get in the second room. In fact I could not even eat it but all the other food on offer throughout the magical journey was good I especially loved the dessert as so tangy and a bit different I wish I had another to eat. So if you have never beeen on a Gingerline experience before then I highly recommend this to anyone that loves food, mystery and immersive theatre as you certainly get all of those with Gingerline: Chamber of Flavours V2. Absolutely fantastic! We booked this on a recommendation from a friend and it did not disappoint. Surprises around every corner and it was exactly as advertised, the flavours were outstanding and the whole evening was exciting and energetic. Do it and throw yourself into everything! Had a wonderful birthday evening at The Chamber of Flavours! I can't reveal much about this wacky dining experience...Except it was one of best immersive experience I've done these past months! The decors are very impressive with a lot of details taking you on a unforgettable journey through crazy and unexpected dimensions. Most of the dishes where cleverly thought with unusual flavour combinations except the two last ones which were a bit qualitatively disappointing and weren't reflecting the ticket price. One of them brought me back bad childhood memories! But despite being a bit pricey, it's a fantastic experience with a clever and fun narrative. Highly recommend it as you're guaranteed to spend a great moment. I booked Chambers of Flavour months ago and was so much looking forward! The venue is amazing and the different decors really unexpected and full of imagination. As I can’t tell a lot about the experience it’s going to be hard to describe my mixed feeling about it. As I said the decors were awesome, and the two first dishes we got were elaborated, original and good. It was a perfect savours association. But I remain a bit disappointed by the food which followed and it left me a bit unsatisfied considering the price. But the whole experience is really good! I would recommend going at 4 or more as we are 16 per group, it is better to find ourselves with people we use to laugh with. Worth every penny! As I took my multidimensional journey through culinary explosions, secret locations, alternative settings and interesting conversations... my mind was blown away by how creative the Gingerline group are. Well done team- this is one of London's most enjoyable adventures. This is where you go if you want spectacular food, amazing performances, interesting seating and the best evening a girl can ask for. No matter what your tastes or interests are head along to one of these evenings and you will never look back. Cant wait for my next Gingerline adventure. My fourth Gingerline experience. I really do like the new format, more preferable to a single large space with a large group. The more intimate arrangement with 16 people makes for a more pleasurable experience all round. The food was not great, not as good as last time but edible. The main course choice was polarising. I think I ate the most of it but the rest of my group was not so enamoured. The acting was a tad patchy but the rooms were wonderfully effective. Something seemed to be missing from this trip though... maybe it felt too scripted, needed some more time for interaction with the guests; a more relaxed feel. But always worth the effort. Queue and buy a ticket. Both my wife and I have been to the Gingerline experience a good few times before. We had been to Chambers of Flavour V1 and so as a treat we took along both our daughters for a Christmas treat to Chambers of Flavour V2. From the moment we got our secret instructions, to the end of the evening they (and us) were fully involved in the entertainment. It was so different from V1 and had plenty of surprises. The food didn't disappoint either, empty plates for the most part, even with a fussy eater. Generally the food fitted with whatever experience you were having at the time. Vegetarians were well catered for and didn't seem to miss out in any way. Combined as a whole package, Gingerline provides a very good value experience and does not let you down. How to say anything without ruining what is an evening of incredible surprises and dining delights. This is my 6th Gingerline experience and it just keeps getting better and better. The narrative that takes you from course to course is, as always, immersive and imaginative and sees even the most awkward members of the group fully and un self-consciously participating. The food does not take a back seat to the entertainment - it's always delicious and just enough to leave you totally satisfied. It's worth mentioning that whilst a welcome cocktail and some form of alcoholic delight (be it a sorbet or a tropical cocktail in a bag!) is offered at one stage of your dining experience, any other alcoholic beverages are not included in the ticket price. Even so it's well worth the money and always makes for an evening to remember. This was my 6th Gingerline experience, and my 3rd of the Chambers of Flavour (though the first was actually known as The Lost Island) and it remains my favourite dining experience in London. Naturally I can't tell you anything about what the experience entails because i've been sworn to secrecy but what I can tell you is that this latest installment is the most adventurous yet, with an incredibly clever narrative which sees you journey through time and space to a series of gastronomic delights. The actors are spot on with their roles and have absolutely nailed their story lines and are absolute pro's at improv! You're encouraged to play along which I really like. The food, which is of course an important element of the experience, is sublime. The fish course has stayed in my memory since my visit back in October... it is strong and I definitely don't recommend slurping the remaining juice from the bowl afterwards. Wine is about £20 a bottle but you have to purchase it before you begin the experience, but good news is they do give you handy carriers to take them around with you. Tickets to this are currently sold out BUT I think there are some more coming available in a few days, and there are also plenty for sale on the relevant FB pages so if you want to go, you should definitely do what you can to get a ticket! The Gingerline is an immersive theatrical dining experience in a secret location SOMEWHERE along the East London overground line. Ahead of your booking, absolutely nothing is given away about the menu or the venue, but don't let that put you off. The best parts of this experience are the surprises, and there are lots. Tickets are snapped up within hours of release, so your best bet is to sign up to their mailing list well in advance and wait to pounce! Around 16 diners go through the "multi-dimensional dining machine" at a time, so you'll be mixed up with a new bunch of people for added fun. Each of your five courses is served in a different room with a completely different theme, hosted by an actor to set the scene, serve your grub, and tell you a few jokes. These guys are great fun, and really make an effort to get everyone involved and transport you to another world. The sets which The Gingerline team have cooked up are incredibly detailed and convincing, which adds to the magic of the event. There is a lot of audience participation, so this really is an experience for those who enjoy immersive theatre. Inside "the machine" no phones or cameras are allowed. This is mainly to preserve the secrecy of the event, but also means that guests are fully engaged with the experience, without being distracted by your mate's latest picture of their cat doing something stupid. I would recommend wearing trousers and flat shoes (some crawling is required!) and remember to bring an empty stomach (you'll be eating A LOT) and an open mind. You'll have way more fun if you relax and go along with the adventure, without worrying about embarrassing yourself or feeling awkward. Once your experience begins, you'll only have one designated loo break - Worth bearing in mind if you have a bladder the size of a walnut! Afterwards, you will become a member of the Chambers Alumni, part of an exclusive club sworn to secrecy. We didn't want it to end! You might have heard of the immersive gastronomic endeavours staged by the Gingerline, a troop of so-called “clandestine dining adventurers”, or you might know absolutely nothing about it. In August 2010, The Gingerline experiences began as theatrical nomadic feasts in secret locations dotted along East London’s Overground line; on tube maps, Londoners know that the Overground is designated by the colour orange - hence the moniker. Past productions were shrouded by a veil of secrecy and seemed to disappear into thin air before you could snap up a ticket, leaving only legendary word of mouth behind that never seemed to abate. In the salad days, you would occasionally bump into someone who had been and maintained their oath of silence diligently. But the Gingerline has gotten bigger and now lingers in one spot long enough to make attendance possible, provided you have fast enough fingers to buy a ticket on the date of their release online. 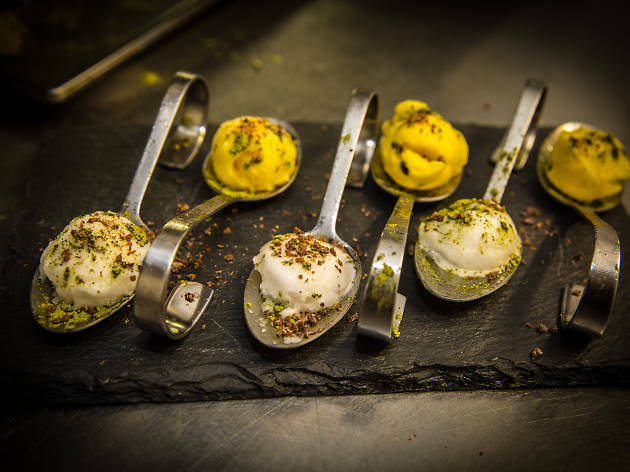 To date, the Gingerline has manifested itself in three incarnations: The classic Gingerline, the Chamber of Flavour and The Institute of Flavourology. 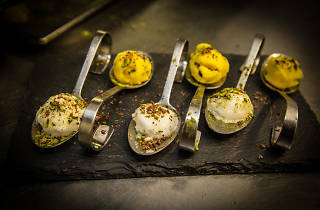 In the past year, I was fortunate enough to be whisked away on a culinary adventure with the first two variations of Gingerline, including the classic Gingerline, which unfolds across a single parallel reality, and the Chambers of Flavour V1, which guided guests across several dimensions. Despite being a weathered Gingerline diner, I was still desperate to get on board the Chambers of Flavour V2, a reboot of the first staging. Although I was savvy with the loose concept, I still went in with the same sense of overwhelming wonder, anticipation and hunger as I did my first time. And I wasn’t disappointed. I perhaps knew what to expect in terms of the overarching structure of the event, but I still had absolutely no concept of what universes we would stumble through. Version 2 is an entirely fresh adventure that is just as thrilling, mesmerising and enchanting as the first version. There was no overlapping or repetition and every surprise was genuine and relished. Without going into too much detail, every diner passes through five realities, one room where each course of a lavish feast is served. Guests travel through a machine to experience gateways of inter-dimensional gastronomy. Basically, guests always show up at tea time, no matter what the reality. If that all of that seems a bit obtuse, I do apologise. But you are better going into Gingerline with absolutely no expectations or comprehension of what you’re embarking upon. Know only that with your ticket, you will get a delectable meal and the best and most engaging theatre that you can find anywhere in London. You’ll interact with your hosts and will have one of the most memorable and fantastic escapades of your life. If you get nothing else out of this review, take this: please just buy a ticket and see for yourself. You can thank me later.